On July 9, Starbucks announced that by 2020, it plans to phase out plastic straws from all its stores worldwide (four days later, it clarified that it will continue to offer straws to customers who need or request them). Activists hope Starbucks’ announcement will lead other companies to follow suit in eliminating these and other unrecyclable, single-use items. But why stop there? One of the big downsides to disposable straws is they end up in our waterways, along with a lot of other stuff. In the TED community are people who’ve made it their life’s work to study, document and conserve the planet’s marine life and habitats. They see up close the consequences of the 8.8 million tons of plastic waste entering the oceans every year. So, we asked them: What everyday plastic item would you like to ban, and why? We had them focus on objects that we all come into contact with, since these are within our control. Now, contemplating the plastic pollution problem may make you feel angry, gloomy or frustrated (or all three). We feel that way too. But we hope hearing from these experts will also help you feel like you’re part of the solution — by looking at the plastic that passes through your hands every day and thinking about what you could live without. Microfibers. Microfibers, which are shed by the synthetic fabrics found in yoga pants and fleece jackets, are underrated, insidious plastic pollutants. Every time the fabrics are washed, the water carries away some of their fibers, which end up in the ocean. Unfortunately, this happens even with polyester fabrics made from recycled plastic bottles. (Editor’s note: Here’s an article with 15 ways we can reduce microfibers.) Another item I’d ban are cotton swabs with plastic shafts. We found a lot of these in the Balearic Islands Hope Spot in the Mediterranean Sea, where plastic routinely washes up on the shore. Single-use plastic items such as plastic wrap, straws, cups, bags and utensils; and microfibers from synthetic fabrics. With the first, we’ve seen innumerable cases of mortality in wildlife and cases of endocrine disruption in humans as a result of single-use plastics, and there are so many reusable versions of these items sold in stores. As for the second, microfibers from plastic fabrics have invaded the biosphere. They’re in our water (bottled and tap), beer, air, honey and salt. They’ve been shown to pass the blood-brain barrier and cause changes in fish behavior. Those plastic packing straps that keep boxes secure during shipping. Many straps don’t get disposed of properly, and they find their way to the ocean. Young marine animals are especially curious about such debris, and a plastic noose can choke a growing animal. At The Marine Mammal Center, we commonly see animals entangled in plastic trash, and these entanglements can cause debilitating, even life-threatening injuries. We’ve rescued patients (like sea lion Blonde Bomber) trapped by packing-strap nooses. You can reduce their use by buying products produced locally. Businesses can, and should, switch to sustainable, compostable/biodegradable shipping materials. At the very least, cut any packing-strap loops. While it won’t reduce litter, it could save an animal’s life. Those gawd-awful machines at airports that wrap people’s luggage in plastic. Security officers cut through the plastic when they’re doing a search, rendering the wrappings useless. Using it also broadcasts to thieves that this is a bag to target. Travelers should use TSA-approved locks on their bags; they cost the same as the wrapping, and they’re reusable. I’d also ban plasticulture. It’s overtaken agriculture — when I drive through the Salinas Valley, all I see are fields of plastic glinting in the sun. Not only does it put plastics into the soil, but it creates a massive amount of waste. But perhaps even more important than imposing bans are creating incentives and robust research programs to develop bio-benign materials. Without viable replacements, it will be much tougher to implement a successful ban. All take-out-related single-use plastics. Restaurants, cafes, bars and businesses should stop giving out plastic straws, stirrers, lids, cups, utensils and bags — all of these so-called small items add up to a major plastic pollution crisis. A recent study estimated that 8,300 million metric tons of plastics have been produced to date, but since about 91 percent isn’t recycled, the vast majority has ended up in our environment. Think reusable and not disposable. Bring your own bags to the store, refuse plastic straws when you order a drink, and bring your own reusable water bottle and cup. Plastic bags. They’re wreaking havoc in the natural world. I’ve seen a dead sperm whale with its stomach full of compressed bags, and a sea turtle choking because it tried to eat a plastic bag. Bags are killing countless sea mammals and birds every year. And for what? Our convenience? 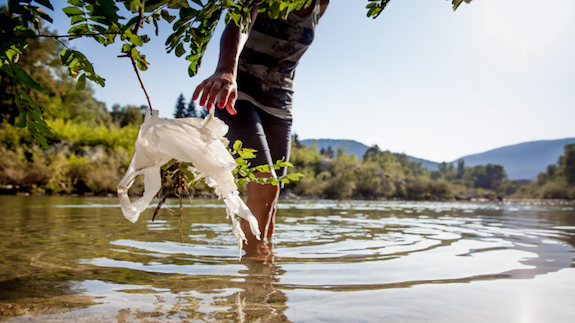 Businesses should stop offering plastic bags. The government of Rwanda prohibited them in 2008, and it now has the cleanest streets, roads and fields I’ve seen anywhere. Plastic bags. In the ocean, leatherback turtles mistake floating plastic bags for jellyfish — their favorite food — and suffer devastating consequences when they eat them. Always carry tote bags in your car and anywhere you might need them. Initially, it will be hard; you’ll forget. But for the turtles’ sake, just vow to try harder. Personal care products made with plastic microbeads. After they go down our drains, these microplastics go into freshwater systems and the ocean, where they can enter the food web, starting with plankton. Microbeads are already banned in some places, but we need to ban them everywhere. You can find many products made with safe ingredients that have the same abrasive effects that microbeads offer. Styrofoam cups and food containers. For years, I lived in Portland, Oregon, where these products were banned in 1998. It’s been a disappointing eye-opener to see it still going strong in the outside world. When I pick up trash in Mexico where I’m working to help regenerate coral reefs, I find crushed-up, filthy cups and plates on the ground and blowing out of dumps, fragmenting, and floating in the water. Because all marine life consumes this toxic material, styrene — which is a carcinogen — is getting into all of us. Banning styrofoam won’t be easy. It will require establishing reliable recycling programs, robust local landfill operators and possibly new import relations, yet the alternative is living in a world awash in a material that takes 500 years to degrade. Microfibers. These tiny fibers are too small to be filtered out by standard wastewater treatment. Scientists are just starting to study them, so they don’t fully know the harm they’re causing. But they know they’re entering the food chain — one-third of fish caught in the UK are contaminated with microplastic. Another study found 83 percent of drinking water samples around the world were contaminated. We should produce and purchase clothing made from natural materials, such as cotton, silk, linen and wool, and also buy fewer fabric items and wash them less often. Microfibers. Microfibers are shed from cheaply produced plastic fiber-based clothing when they’re worn and washed. We’ve seen plastic fibers — although they might be from many sources — ingested by animals living thousands of meters below the seafloor. Besides producing and buying clothes that last longer and using natural fibers, we need to design fabrics that can be recycled and new methods to recycle the fabrics we have. Plastic straws. I saw a heartbreaking video of a plastic straw being extracted from a sea turtle. Searching for reusable straws in my kitchen, I found some of my daughter’s plastic cartoon-character straws. I’m thinking of starting to carry a Tweetie Bird straw to use for drinks and as a conversation piece. Businesses should either ban plastic straws or make people request them if they need them. Plastic straws. They’re used for a matter of minutes, then last for years and years. I’ve seen them tangled up in various marine animals as I’ve dug in the ocean, and, of course, they get littered all over the place. Paper straws are a perfect replacement. While doing away with single-use, non-recyclable items is a step in the right direction, we should replace all petroleum-based plastics. This means inventing bioplastics and other materials that don’t persist for decades or degrade into harmful substances. I’ve seen plastics of all kinds polluting the most remote waters and beaches in the world. We need a “Manhattan Project” for plastics: an initiative that drives people to invent similar materials that aren’t harmful to life in the ocean. If we’re smart enough as a species to put a lander on Mars, why can’t we invent good replacements for plastic? I see the whole public conversation around plastic straws as a shot of morphine into our collective veins to avoid facing what actually matters. The production and consumption of the following items — and all of the fuel, raw materials and pollution they entail — continues to rise, unabated, in the world: computers, phones, tablets, servers and server farms; military weapons; container ships and shipping facilities, commercial airliners, cruise ships, helicopters, pleasure boats, jet skis, lawnmowers, leaf blowers, motorcycles, cars and trucks, refrigerators, washers and dryers, air conditioners, televisions, condominiums, housing developments, apartment and office buildings, shopping malls, paved roads/highways, dams, and power plants. Together, these represent a colossal crisis of environmental degradation and climate destruction that has all but dropped off the collective radar. This piece was adapted for TED-Ed from this Ideas article. Why do nouns exist? A writing teacher explains.